I am so excited to have Ali back with another recipe from her amazing book Bowls of Love: Paleo Soups for the Seasons. This roasted tomato soup looks phenomenal and is a perfect recipe to celebrate Valentine's day. Ali stopped by last year and shared one of the most popular posts on my site, her Butternut Squash Bisque. Having tried that, read all the reviews and seen how quick it spread like wildfire, I am excited for this Roasted Tomato Soup with fresh basil. Now I will leave you with Ali, once your done make sure you go grab her book Bowls of Love and cook this delicious Roasted Tomato Soup. Happy February! I'm Ali from Intersection Coaching, and I am thrilled to be back on Civilized Caveman doing another guest post. 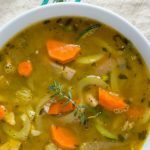 Today is an extra special post because I am talking about my new cookbook, Bowls of Love: Paleo Soups for the Seasons. For those of you who don't have your copy yet, you are officially missing out! Bowls of Love contains 49 seasonal paleo soup recipes (smart title, right?) with a very special focus that is perfect for the upcoming Valentine's Day. Bowls of Love focuses on the fact that we can share love with others through the food that we cook. To celebrate this concept, I reached out to 49 of the most special people to me in my life from all over the world and asked them to send me a bowl. I was so overwhelmed with the incredible and loving responses, each one filling me up with more love and creativity. Day after day, bowls were arriving at my doorstep, and I crafted a paleo recipe for each one. Every single recipe comes with a full-page photo (we know how important that is!) and is accompanied with a heart-warming story dedicated to the person who provided the bowl. If you love food, cooking, paleo, or sharing love and community through food, this book is definitely for you! Today's recipe is extra perfect for Valentine's Day with the rosy red color and it is easy enough for a first-time cook. Try it out and you will be sure to impress your Valentine! This roasted tomato soup is a fan favorite in my cookbook and is dedicated to my step-dad Ron a.k.a. Rosy. I first met Ron in January of 1994, opening the door in my princess pajamas to find the man who was about to take my mom out on a blind date. “Oh, great! You brought me a big sandwich!” I exclaimed, seeing the long white box he cradled in his arms. I was crushed to find out that they were actually long-stemmed roses for Mom instead of a tasty treat for me. On date number two, I eagerly answered the door again and saw Ron with another long box. Proudly, Ron told me, “These are chocolate roses just for you,” as he watched me eyeing the package again. Blunt as could be, I admitted that I hated chocolate. I was a girl who loved food, but I sure was particular! Instead of letting my honesty get him down, Ron spent the next two decades changing my mind about this particular sweet and becoming an integral part of our family, ultimately marrying my mom! Ron was and is always the perfect gentleman and Valentine, and now we enjoy many treats, meals, and of course soup together! For 15% off of Bowls of Love, use code VALENTINE15 here (limited time). Enjoy this roasted tomato soup and your Valentine's day with someone special. Don't forget your copy of Bowls of Love (with 15% off using VALENTINE15) to keep your heart and bellies full the rest of the winter! Happy Valentine's Day!! Slice tomatoes length-wise and arrange on a foil-lined baking sheet. Drizzle 1 tablespoon of oil over tomatoes, and season with sea salt and pepper. Meanwhile, make the pesto: Pulse basil in a food processor. Add all remaining ingredients, blending until smooth. You may need to scrape down the sides so everything mixes well. Add additional pine nuts or olive oil if you prefer your pesto thicker or thinner. In a large soup pot, heat remaining 1 tablespoon of oil over medium heat, and add onion, shallot, and garlic. Cook 10 minutes until tender. Add basil, canned tomatoes, stock, and roasted tomatoes, and bring to a boil. Simmer covered over medium-low heat for 30 minutes. Purée the soup until smooth, and serve piping hot, topped with a drizzle of fresh pesto. Ali Rakowski is a certified health coach based in Stamford, CT. She works with clients on nutrition, energy, weight loss, stress, and holistic health. Her blog includes hundreds of colorful, easy-to-make paleo recipes. You can also check her out on facebook, twitter, instagram, and pinterest.